Lampa je napravljena od elemenata kovanog gvozdja ukomponovanih na najbolji moguci nacin koji je u datom trenutno upotpunilo umetnicko nadahnuce. 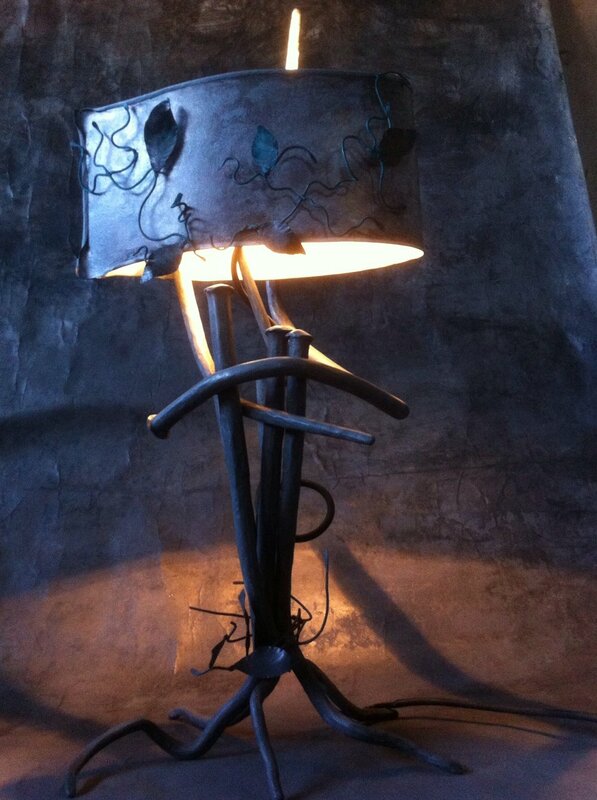 Za vise informacija mozete napraviti kontakt kroz proputovanje u rubrici - "O meni" i "Kontakt"
The lamp is made of elements of wrought iron incorporated in the best possible way that is currently completed by artist inspirers. For more information, you can make contact by traveling in the section - "About me" and "Contact"
My work and great example of traditional wrought iron that I like. Simbiosis of both will be great. HOMELAND How looks your work day? NIKOLA PANTOVIC In the evening devise and plan what I will do tomorrow. I make sketches and thinking. During operation, all changes, sketches cease to be valid, opened new landscapes that start to resemble the works, which will be freed from the iron or from the same build ... They say it is a process inherent to artists. It is a constant struggle with the material ... The experience on the paper is completely different from the impression you may have when modeling the steel material in space. My working day is generally chaotic. New thoughts, ideas sometimes chase and surpass me, waiting in the workshop ... I think that art is not achieved planned. That do designers. HOMELANDWhich are the first memories of forging steel? HOMELAND When did you start to work in the family workshop Blacksmith? NIKOLA PANTOVIC The moment I was tired of being bored. I was on vacation. I spent time in idleness. I've always had a good pocket money when I helped the father. So I went into the shop and I'm not leaving. HOMELAND When did you realize that you go the same way as your father? And when you realize your mastery in the art world? HOMELAND What are you most proud of? NIKOLA PANTOVIC I am most proud of endurance that I gained personal work and sacrifice in college. Believe me, it takes more than words. In this way, for every young artist, patience is crucial. You want everything immediately. I was fortunate that my biggest support in life, apart from their parents, is the older sister. She is supported in every doubt. Like today. She brings me a first tasks and contacts. At that time, in parallel with the faculty, I was already selling my "strange" steel fence. HOMELAND Who are your favorite teachers, mentors, in addition to the initiators, father You gave all his knowledge, as in fairy tales heirs hand over the keys and the throne of the city where miracles come true? HOMELAND Who are your role models and who are the colleagues with whom I would like to work with? NIKOLA PANTOVIC first model, the first experience of art and first guide through the world of what life can become the artist himself, and the biggest was and remained Leonardo, is the embodiment and realization of everything that we are and all that we become when we are gone. The Renaissance man, a genius, and operators, uomo universale gave me an example of how one can deal with all sorts of things ... I applied to different fields of art, and in numerous personal research. Dali loved for its precision, Picasso because of productivity, Caldera sake of simplicity ... I'd like a Jeff Koons code secret of their color ... I imagine your fences and gates so colored! I would like to cooperate with futuristic architects such as Zaha Hadid, Calatrava, Tadao Ando. HOMELAND Inspiration is like a wild horse, who does not learn to ride him often remains lost, exhausted, I ... How much longer time you spend working on sculptures and whether you're equally dedicated to drawing and painting? NIKOLA PANTOVIC One sculpture I started a during a faculty and completed by the end of the same. Studies last five years ... I'm usually working more sculptures at the same time while the rest of the one doing the following. So it is with painting. Drying is a long process and time is precious. I do not like idle when I'm in creative acceleration. HOMELAND Got an offer for making a documentary film about yourself, your family and forge your steel art. How does it look synopsis? NIKOLA PANTOVIC Honestly, I don't know. I leave it to a friend playwright. Yet it is in the domain of some I do not just close the arts. HOMELAND You play the music, playing the guitar. Have you wanted to make a new instrument, much iron? NIKOLA PANTOVIC Music and playing me further meet. Music gives me zest and with her always create. I played bass guitar as a teenager. Melody bass guitar feels good. I've been thinking about making the process of creating an instrument. Extolled acoustics! I'd try to build instruments in a combination of wood and metal. These two materials create the perfect combination to be decoded. HOMELAND What are the areas of art that are closest to you and who are your favorite writers and composers? NIKOLA PANTOVIĆ Applied Arts, sure. Sculpture. First I studied design at the Higher Polytechnic suppose I was there learned that thinking applied to all be ergonomically. Enough I painted under the influence of Dali. From writers would mention Dina Buzzati, Wilhelm Reich, Richard Bach. I love music and always listen to what I am at any given moment launches. HOMELAND which these exhibitions and awards favorite? NIKOLA PANTOVIC I'm not too exhibited, time mastering the techniques did not want to compensate for other activities. Many prefer to boast a large number of exhibitions, and I rejoice technical and structural skill that I have, I believe, in that time learned and mastered. Now I'm ready for the show! I applied at several competitions and waiting for answers. HOMELAND What inspires you most and what is your greatest strength? HOMELAND What's your secret, the secret of these brilliant works of art? NIKOLA PANTOVIC No secrets. The point is clear. Good passing only those who find a good manager. This is how the art from time immemorial. Security frees the spirit. HOMELAND Who is your biggest support and how you see yourself in ten years? NIKOLA PANTOVIĆ family is my biggest support. Support my friends, people that surround me. In business terms, I stopped to imagine themselves in the future. I'd like to meet a lot of rich people who can afford to pay what you create. Then the art itself harbors. HOMELAND Which song do you like to start your day? NIKOLA PANTOVIC La Boheme my morning thing! HOMELAND Does man gets or loses strength and focus of sharing life with another person? NIKOLA PANTOVIC definitely wins. All of my creative energy is always dedicated to someone. To each day that I rise won discontent, there must be more reason and of art itself. HOMELAND What are the colors, shades of iron that you like best? NIKOLA PANTOVIC There are plenty of colors and shades that I like, actually, I can not vouch for any ... All are equally interesting and beautiful. Preparing to one day realize my childhood dream, I'll do the image of metal! I would start with the classic drawing and ended with the abstract. Metal and its textures have a large range of colors and patina. With these qualities can be easy to paint. They make it big formats. HOMELAND Is it easier to work alone or in the company? NIKOLA PANTOVIC In society. I always have someone besides yourself. When I started to paint the company as we made friends who were in my room watching the movie while I painted. In college, it was collective. It is true that the artist needs solitude but it is also necessary and the connection with reality, as well as someone who will renew all the time to establish the connection. In moments of pause and rest, the presence of life around you restores energy and creates conditions for further work. HOMELAND What qualities one must have in order to go through ups and downs with a smile and constantly gaining knowledge? NIKOLA PANTOVIC Perseverance and vision. They perfectly complement one without the other can not. HOMELAND Whether and why regret? NIKOLA PANTOVIC Maybe, I have not finished and management in the arts. HOMELAND What is what defines the moment in which man makes his choices: what to study, to work, who you hang out, where to go? NIKOLA PANTOVIC If you have a healthy family, and have a sound basis for decision making, which will be seen as either good or best for you. After these healthy choices, everything else superstructure through personal experience. Life is amazing, the most miraculous to those who trust him and live with him admiring it and cultivating it as a tree whose fruits are eternal and our mortals. ZAVIČAJ Kako izgleda Tvoj radni dan? NIKOLA PANTOVIĆ Uveče osmišljavam i planiram šta ću sutra raditi. Pravim skice i razmišljam. U toku rada sve se menja, skice prestaju da važe, otvaraju se novi predeli koji počinju da podsećaju na dela, koja ću osloboditi iz gvožđa ili ih od istog sagraditi... Kažu da je to proces svojstven umetnicima. Rušim i gradim. Konstantna je borba sa materijalom... Doživljaj na papiru je potpuno drugačiji od utiska koji imate dok oblikujete materijal u prostoru. Moj radni dan je u principu haotičan. Nove misli, zamisli ponekad jure i prestižu me, čekaju u radionici… Mislim da se umetnost ne postiže planski. To rade dizajneri. ZAVIČAJ Koja su prva sećanja vezana za kovanje gvožđa? ZAVIČAJ Kada si počeo da odlaziš poslom sa ocem u porodičnu Kovačnicu Pantović? NIKOLA PANTOVIĆ Onog trenutka kada mi je dosadilo da se dosađujem. Bio sam na raspustu. Provodio vreme u dokolici. Uvek sam imao dobar džeparac kad bih ocu pomagao. Dakle, ušao sam u radionicu i više nisam izlazio. Od tada, na dosadu, gledam kao na presudnog pokretača moje kreativnosti. ZAVIČAJ Kada si shvatio da odlaziš istim putem kao i Tvoj otac? I kada si shvatio da Tvoje majstorstvo Tebe odvodi u svet umetnosti? ZAVIČAJ Na šta si najviše ponosan? NIKOLA PANTOVIĆ Najviše sam ponosan na izdržljivost koju sam stekao ličnim radom i odricanjem na fakultetu. Verujte, za to je potrebno mnogo više od reči. Na tom putu, za svakog mladog umetnika, strpljenje je presudno. Želis sve i odmah. Ja sam imao sreću da mi najveća podrška u životu, pored roditelja, bude starija sestra. Ona me je podržavala u svakoj nedoumici. Kao i danas. Nalazila mi je prve poslove i kontakte. Malo je studenata koji od svoje umetnosti mogu da žive. U to vreme, paralelno sa fakultetom ja sam već prodavao svoje " čudne" ograde. ZAVIČAJ Ko su Tvoji omiljeni profesori, mentori pored inicijatora, oca koji Ti je darovao sve svoje znanje, kao što se u bajkama naslednicima predaju ključevi i tron grada u kome se ostvaruju čuda? ZAVIČAJ Ko su Tvoji uzori i ko su kolege sa kojima bi voleo da sarađuješ? NIKOLA PANTOVIĆ Prvi uzor, prvi doživljaj umetnosti i prvi vodič kroz svet onoga što život može postati a umetnik i sam, i to najveći bio je i ostao Leonardo, otelotvorenje i ostvarenje svega što jesmo i svega što postajemo i kada nas više nema. Taj renesansi čovek, genije i delatnik, uomo universale dao mi je primer, kako se čovek može baviti raznim stvarima... Primenio sam to na različite oblasti umetnosti, i u brojnim ličnim istraživanjima. Dalija sam voleo zbog preciznosti, Pikasa zbog produktivnosti, Kaldera zbog jednostavnosti… Voleo bih da mi Džef Kons oda tajnu svojih boja... Zamišljam svoje ograde i kapije tako obojene! Voleo bih da sarađujem sa futurističkim arhitektama kakvi su Zaha Hadid, Kalatrava, Tadao Ando. ZAVIČAJ Inspiracija je poput divljeg konja, ko ne nauči da ga jaše često ostaje izgubljen, iscrpljen, sam… Koliko najduže vremena provedeš radeći na skulpturama i da li si jednako posvećen crtanju i slikanju? NIKOLA PANTOVIĆJednu skulpturu sam započeo pre fakulteta a završio je po završetku istog. Studije traju pet godina... Obično radim više skulptura u isto vreme, dok se odmaram od jedne radim sledeću. Tako je i sa slikanjem. Sušenje je dug proces a vreme je dragoceno. Ne volim prazan hod kada sam u kreativnom ubrzanju. ZAVIČAJ Dobio si ponudu za izradu dokumentarnog filma o sebi, porodičnoj kovačnici i svojoj umetnosti. Kako izgleda sinopsis? NIKOLA PANTOVIĆ Iskreno me znam. Prepustiću to prijatelju dramaturgu. Ipak je to u domenu neke meni ne baš bliske umetnosti. ZAVIČAJ Baviš se i muzikom, sviraš gitaru. Da li si poželeo da napraviš neki novi instrument, baš od gvožđa? NIKOLA PANTOVIĆ Muzika i sviranje me dodatno ispunjavaju. Muzika mi daje polet i uz nju uvek stvaram. Svirao sam bas gitaru kao tinejdžer. Melodija bas gitare mi prija. Razmišljao sam o pravljenju i procesu stvaranja instrumenta. Veličao bih akustiku! Pokušao bih da instrumente gradim u kombinaciji drveta i metala. Ta dva materijala stvaraju savršenu kombinaciju koju treba odgonetnuti. ZAVIČAJ Koje su oblasti umetnosti koje su Ti najbliže i ko su Tvoji omiljeni pisci, kompozitori? NIKOLA PANTOVIĆ Primenjena umetnost, svakako. Vajarstvo. Prvo sam studirao dizajn na Višoj politehničkoj Pretpostavljam da su me tu naučili da razmišljam primenjeno, da sve bude ergonomski. Dosta sam slikao pod uticajem Dalija. Od pisaca bih izdvojio Dina Bucatija, Vilhelma Rajha, Ričarda Baha. Muziku volim a uvek slušam ono što me u datom trenutku pokreće. ZAVIČAJ Koje su Ti izložbe i nagrade najdraže? 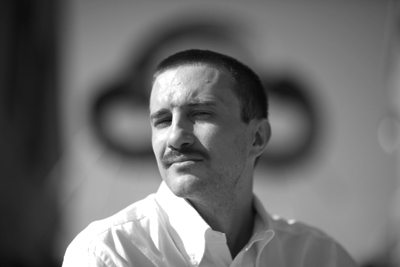 NIKOLA PANTOVIĆ Nisam previše izlagao, vreme savladavanja tehnike nisam želeo da kompenzujem drugim aktivnostima. Mnogi vole da se pohvale velikim brojem izložbi, dok se ja dičim tehničkom i strukturnom veštinom koju sam, smatram, za to vreme izučio i savladao. Sada sam spreman za izložbe! Aplicirao sam na nekoliko konkursa i čekam odgovore. ZAVIČAJ Šta Te najviše inspiriše i šta je Tvoja najveća snaga? ZAVIČAJ U čemu je Tvoja tajna, tajna ovakvih sjajnih umetničkih dela? NIKOLA PANTOVIĆ Nema tajne. Stvar je jasna. Dobro prolaze samo oni koji pronađu dobrog menadžera. Tako funkcioniše umetnost od vajkada. Sigurnost oslobađa duh. ZAVIČAJ Ko je Tvoja najveća podrška i kako vidiš sebe za deset godina? NIKOLA PANTOVIĆ Porodica je moja najveća podrška. Podrška su mi i prijatelji, ljudi koji me okružuju. Što se posla tiče, prestao sam da zamišljam sebe u budućnosti. Voleo bih da upoznam dosta bogatih ljudi, koji mogu da plate ono što stvaram. Tada umetnost samu sebe gaji. ZAVIČAJ Kojom pesmom voliš da započneš dan? NIKOLA PANTOVIĆ La Boheme je moja jutarnja stvar! ZAVIČAJ Da li čovek dobija ili gubi snagu i fokus deleći zivot sa drugom osobom? NIKOLA PANTOVIĆ Definitivno dobija. Sva moja kreativna energija je uvek posvećena nekome. Da bih svakog dana kad ustanem pobedio mrzovolju, mora postojati veći razlog i od same umetnosti. ZAVIČAJ Koje su boje, nijanse gvožđa koje najviše voliš? NIKOLA PANTOVIĆ Ima dosta boja i nijansi koje volim, zapravo ne mogu da se opredelim ni za jednu... Sve su podjednako zanimljive i lepe. Pripremam se da jednog dana ostvarim svoj dečacki san, radiću slike od metala! Počeo bih sa klasičnim crtežom a završio sa apstraktnim. Metal i njegova tekstura imaju veliki spektar boja i patina. Sa tim kvalitetima može se lako slikati. Bili bi to veliki formati. ZAVIČAJ Da li je lakše raditi sam ili u društvu? NIKOLA PANTOVIĆ U društvu. Uvek imam nekog pored sebe. Kada sam počinjao da slikam društvo su mi pravili prijatelji, koji su u mojoj sobi gledali film dok sam slikao. Na fakultetu je to bio kolektiv. Tačno je da umetniku treba samoća ali isto je tako potrebna i veza sa realnošću, kao i neko ko će sve vreme uspostavljati obnavljati tu vezu. U trenucima pauze i odmora, prisutnost života u tvojoj okolini, obnavlja energiju i stvara uslove za dalji rad . ZAVIČAJ Koje osobine čovek mora da ima da bi prolazio kroz uspone i padove sa osmehom i neprekidno stičući znanje ? NIKOLA PANTOVIĆ Istrajnost i vizionarstvo. Oni se savršeno dopunjuju i jedno bez drugog ne mogu. ZAVIČAJ Da li se i zbog čega kaješ? NIKOLA PANTOVIĆ Možda, što nisam završio i menadžment u umetnosti. ZAVIČAJ Šta je ono sto određuje momenat u kojem čovek pravi izbore: šta će studirati, raditi, sa kim se družiti, kuda otići? NIKOLA PANTOVIĆ Ako imaš zdravu porodicu, imaš i zdrav temelj za donošenje odluka, koje će se pokazati kao ili dobre ili najbolje za Tebe. Posle tih zdravih izbora, sve je ostalo nadgradnja kroz lično iskustvo. Život je čudesan, najčudesniji onima koji mu veruju i žive ga diveći mu se i gajeći ga kao drvo čiji su plodovi večni i nama smrtnima. Me with ''Secret passage'' gate I made for the customer with a special taste for art.